Puppies, puppies and more puppies! 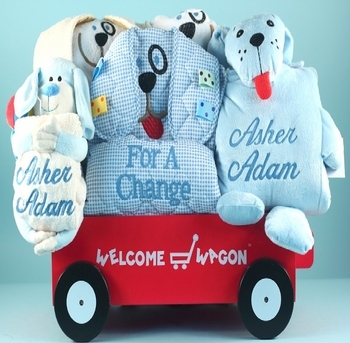 You can�t go wrong with a puppy themed gift for any baby boy. This adorable ensemble features two different personalized baby blankets plus some fun and practical items for both mom and baby. Each blanket has a puppy character design and comes personalized with two lines of embroidery which is great for adding a birth date or middle name! We then add a puppy design diaper changing pad, a puppy hooded bath towel, a puppy bib and plush puppy toy. Everything is loaded into our exclusive wooden mini wagon providing a great presentation and a useful toy for pulling things around! Quilted puppy diaper changing pad. Personalized micro fiber puppy blanket. The entire collection is then lovingly gift wrapped in sheer tulle material for a truly impressive appearance! Processing Time Personalized: 3-5 business days Does not include shipping time.